The Azure Window collapsed last Wednesday. The collapse of the Dwejra window should make us reflect on our national heritage, the Curia's Environment Commission warned this morning. 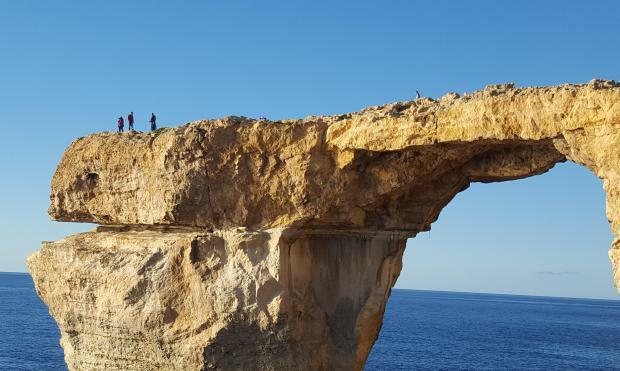 The public and politicians are right to believe they have lost part of their national heritage after the Azure Window crashed into the sea last Wednesday. "But the incident should encourage everybody to put forward pertinent questions about what we are doing to sustainably manage the resources we still have left," the commission said in a statement. It was sad that for several years the country failed to be shocked by the damage caused to the natural and built environment because of unsustainable policies, projects or plans. "We've tolerated this harm and it was justified politically by several governments, despite the objections of those who had the courage to speak against it. If we had to collect all that we've lost over the years because of unsustainable behaviour, the sorrow would be even greater than that expressed over the collapse of the Dwejra window." The Azure Window is lost forever but it will hopefully open the door to the public and politicians to take action to manage better our natural and historical resources before it is too late, the Church said. Meanwhile, the San Lawrenz council, which is responsible for the area, emphasised the rich environmental and cultural potential of the entire Dwejra area. It said the importance of the Azure Window was not as a structure in isolation but as part of a wider context, encompassing a variety of geological characteristics above and below the sea, a natural environment enriched by numerous species of unique flora and fauna and a spectacular coastline displaying different rock formations. “The natural process we have just experienced presents society at large with the challenge to unite and safeguard our natural heritage which not only adorns our islands but offers us the required potential to entice others to visit us,” the council said. It encouraged the government to take the necessary steps to put in place a serious management plan for the whole Dwejra site and to provide the council and other authorities with the required finances and legislative tools to implement it. It pledged to intensify its efforts and initiatives in tandem with the authorities to continue giving Dwejra the serious and professional attention it was due.